← Safety-II and Just Culture: Where Now? bad it was and the FACTORY SOUNDS GROW DEAFENING — AND AS IT BUILDS TO A CRESCENDO, WE CUT TO SILENT BLACKNESS. It is 1979. Elizabeth Lamb, the wife of Deputy Sheriff Jack Lamb of Lillian, Ohio, and mother of 14-year-old Joe, is killed in a steel mill accident. The emotive opening to the science fiction film Super8 grimly resets the accident-free counter on the factory’s motivational sign. Apparently, J.J. Abrams had the idea to start a film with the factory’s “Accident-Free” sign long before he came up with the rest of the idea of the film. When I saw this, two issues came to mind. We not only waste time and resources with such exhortations, but focus attention away from where it should be: the system. The sign presents almost perfectly a more fundamental paradox that we have in safety. How can safety be the primary concern of any organisation? 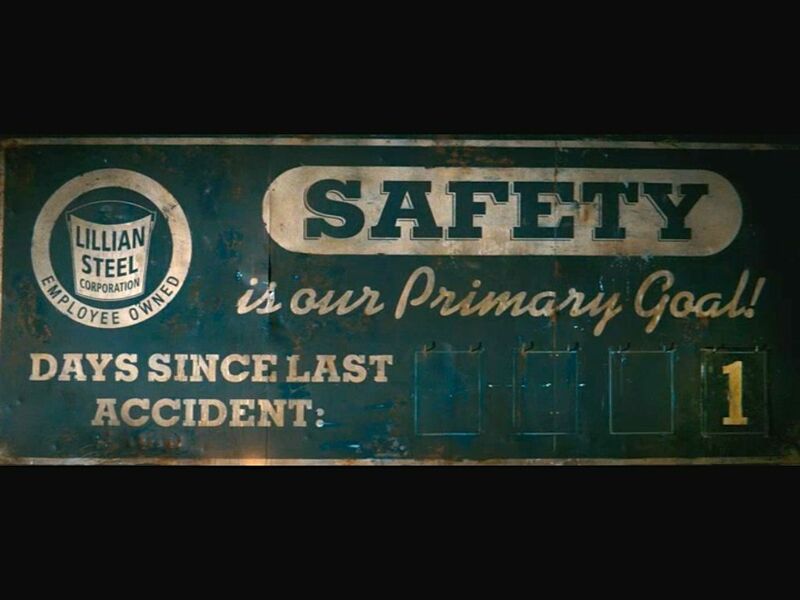 The primary goal of the Lillian Steel Factory cannot be to avoid or prevent accidents, which the sign implicitly suggests as its definition of safety. The primary goal of the Lillian Steel Factory has to be to serve the customer – to meet customer needs – as well as those of other stakeholders. If the primary goal was to avoid accidents, then the most effective solution would be to stop making steel. Safety, then, when defined (only) as avoiding accidents and unacceptable risk, will always be at odds with the real primary concern of organisation: to serve the customer. And it is simple, at least in principle. First, get rid of slogans that tell people to be safe, be careful, do a good job, etc. Second, stop defining safety solely in terms of accident avoidance. That doesn’t reflect the purpose of the organisation and is more of an anti-goal than a goal. Instead, seek to understand systems conditions, such as demand and pressure and the resources and constraints, in the context of the system as a whole, mindful of the purpose(s) of the system. Involve the field experts in all stages of understanding and improving the system. Understand the trade offs they must make, and how they adapt and vary their performance to meet variable demands in light of variable conditions. But see things from their point of view, their local rationality. Understand that nobody goes to work to have an accident; they set out to do their best and achieve a good outcome. Just culture is still important. Get a better idea of the flow of work from end to end, including the interactions between different elements of the sociotechnical system. Understand that system behaviour and outcomes in complex systems are emergent; they cannot be reduced to the behaviour of the human or technical components and are often not as expected, imagined or designed. And last but not least, understand that success are failure are equivalent; they come from the same source: ordinary work. If safety is actually viewed as ensuring things go right (which includes avoiding that things go wrong), then safety really is our primary goal. By ensuring things go right, especially in day-to-day work, we achieve the purpose of the system, by definition. Hollnagel, E. (2014). Safety-I & Safety-II. The Past and Future of Safety Management. Ashgate. This entry was posted in Safety, systems thinking and tagged accidents, safety culture, safety-I, safety-II, systems thinking. Bookmark the permalink. 2 Responses to SAFETY is our Primary Goal!